Here, are the individual effects. In the fixed-effects model, the are unknown parameters. The fixed-effects model can be estimated by eliminating by conditioning on . In the random-effects model, the are independent and identically distributed (iid) random variables, in contrast to the fixed effects model. 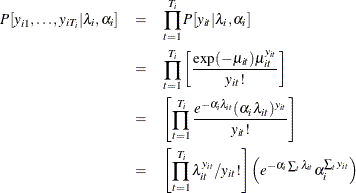 The random-effects model can then be estimated by assuming a distribution for . In the Poisson random-effects model, conditional on and parameter , is iid Poisson-distributed with parameter , and the individual effects, , are assumed to be iid random variables. The joint density for observations in all time periods for the ith individual, , can be obtained after the density of is specified. where is the overdispersion parameter. 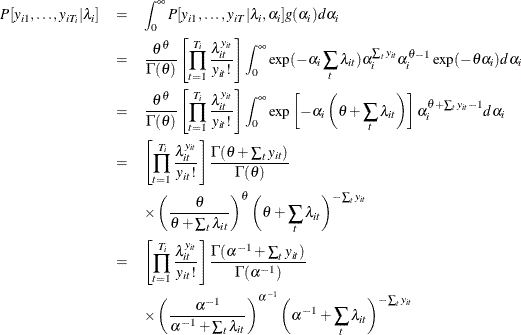 This is the density of the Poisson random-effects model with gamma-distributed random effects. For this distribution, and ; that is, there is overdispersion. where , and is the digamma function.